Sign up for Broadjam today to follow My-Tea Kind, and be notified when they upload new stuff or update their news! 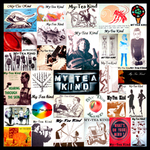 Always Developing and based in Tahlequah Ok, My-Tea Kind consists of Three one of a kind sisters and thier bizarre friend James. Bonnie Paine is able to spread her love and beauty throughout a venue making the rythmic washboard a nesscessity to the beat. Her voice is so elaborate that audiences are often frozen in awe. Annie Paine beams with sure joy and confidence on the Bass. Like a heart throb, her personallity instantly makes an impression. On the drums, Sarah Garde spreads her suttle beats like gentle wind. She sprinkles the rhythm elegantly and with a vibe essential to the uniqueness of MTK. On the guitar and vocals, James Townsend blends his complex dreamlike guitar riffs with the swinging melody of his vocals. They come as a force, seeking a collective learning experience and representing that search through their voice in the language of music.